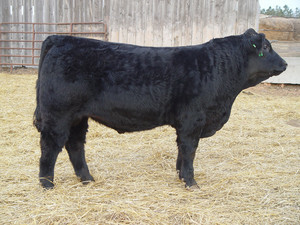 SEMINOLE is a young 75% Salers and 25% Angus bull who shows promise of excellence in nearly every trait that we evaluate. His performance spread is outstanding, combining a weaning ratio of 111 with a birth weight of 79 pounds (ratio 94). His phenotype and structure are designed for longevity with a correct leg and plenty of flexibility to his pasterns. He is long-sided, big-testicled, medium-framed and extremely gentle with extra volume and capacity. There is plenty of milk in his pedigree with both his sire and dam ranking in the top 2% of the breed for milk EPD. There is so much to like about SEMINOLE that we had decided to use him as a herdsire even before he was ultrasounded and scored the largest ribeye that we measured in our 2007 bull calf crop along with an IMF ratio of 123. His dam, a daughter of the breed’s #1 marbling sire, LEGEND, ultrasounded with an IMF ratio of 111 and REA ratio of 108.